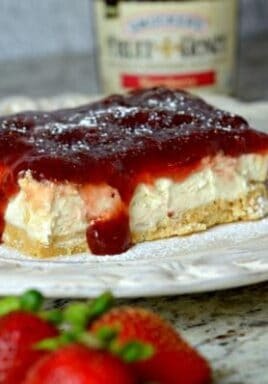 When I was younger my mom always used to make a no-bake cheesecake and it was so good! For our birthdays we each would get to choose a dinner and dessert of our choosing. My dad used to always ask for a cherry cheesecake for his birthday. I loved the cheesecake, but I really, really don’t like cherries. 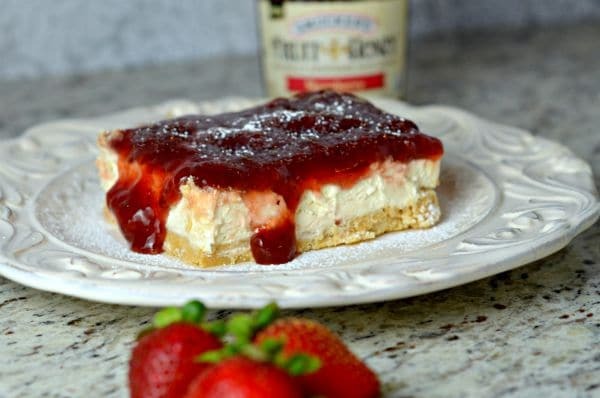 Whenever we would have cherry cheesecake I would have to scrape off the fruit topping, and I vowed that when I grew up I would learn how to make my mom’s recipe so I could have it whenever I wanted. Without cherries. 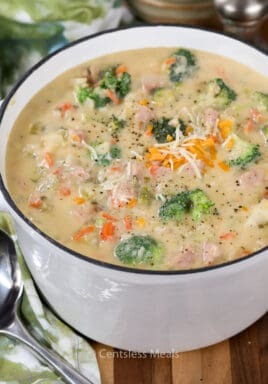 Well, now I’m an adult (unfortunately), and I have my mom’s recipe! I have tried a lot of toppings throughout the years, but I think I have finally found my favorite. 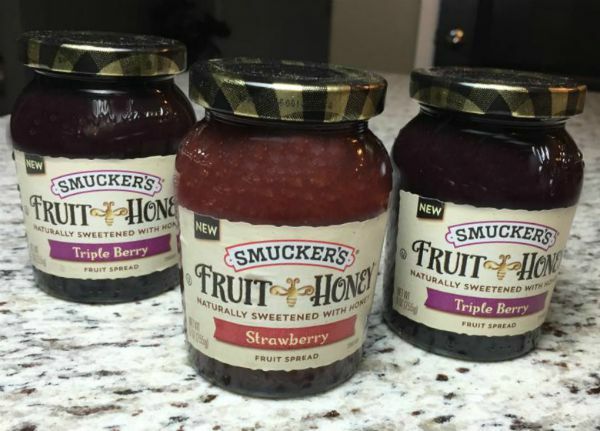 I was shopping at Walmart and I found a new Smucker’s® product called Fruit & Honey. It is a fruit spread that is sweetened with honey. 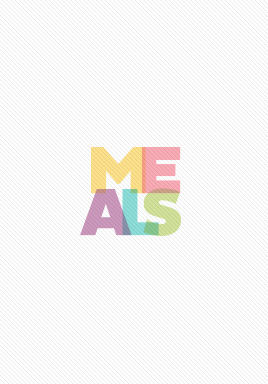 It comes in 4 different flavors: Strawberry, Tropical, Triple Berry, and Blueberry Lemon. I grabbed a couple because I thought these might make amazing toppings for my no-bake cheesecake, and I was right! These are the perfect dessert for those nights when you want something sweet but don't have the time to bake. 1 jar Smucker's® Fruit & Honey spread I used strawberry but you could really choose any one of them and it would be delicious! Place the cookies in a food processor and blend until finely crushed. Once cookies are crushed, pour melted butter on top of them and blend in the food processor until combined. In a greased 8 x 8 baking dish, press cookie mixture down to create the crust. In a large mixing bowl, place the cream cheese and half the whipped topping and mix on medium until blended. Once cream cheese and whipped topping are combined, add in remaining whipped topping, vanilla, and powdered sugar. Once those ingredients are combined, pour onto the cookie crust and spread out evenly. 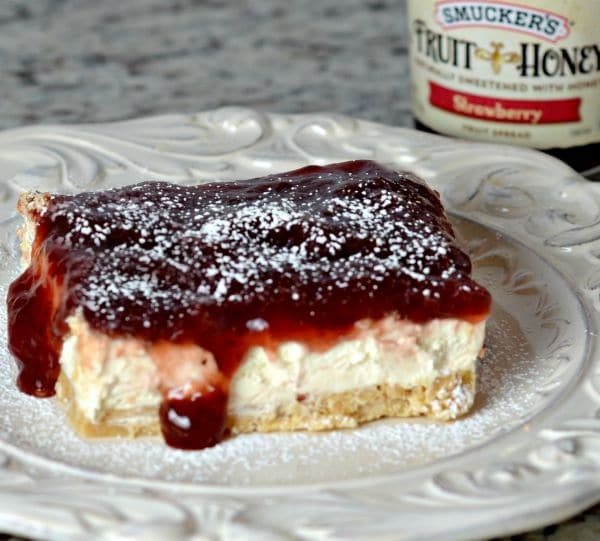 Top with Smucker's® Fruit & Honey topping. These are the perfect dessert for those nights when you want something sweet but don’t have the time to bake. Now that you’ve seen the delicious flavors, which would you choose as your fruit topping? « Previous PostBacon Cheddar Pasta salad!